AES provides advanced technologies and services that support the efficient design, supply and operation of waste-to-energy plants and biogas processes. Environmentally secure, turn-key solutions are provided to industries, commercial set-ups, institutes, hotels, hospitals and to process their organic waste in-house. AES’s anaerobic system is a pre-fabricated modular design that is delivered to site, ready for use. 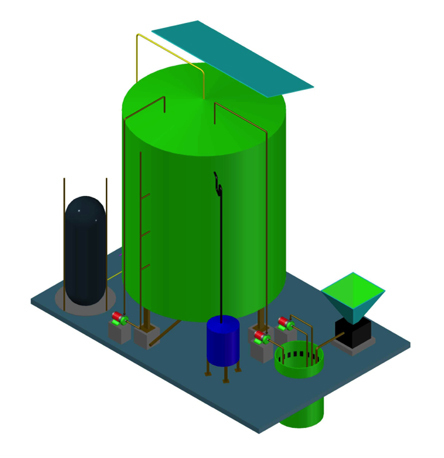 This solution is suitable for small to large-scale feedstock applications. The design specifically aids efficient digestion of kitchen waste, which can include cooked food waste, fruit and vegetable peels, used kitchen oil and grease and organic wastewater like Ganji (rice water) to finally convert into biogas and bio-fertilizer. T3 is an excellent source of alternative fuel and an efficient product for disposal of organic waste, eliminating odor, flies and disposal cost. Biogas is stored and utilized as cooking fuel to replace LPG. This liquid fertilizer, with high nutrition content can be pumped for field spreading/gardening/landscape area. The fertilizer is free from odor and pathogens and is plant ready. Timely and proper waste disposal while replacing non-renewable fuel with biogas makes this compact, plug and play technology capable of providing significant social, environmental and economic benefits. Micro-economical benefits by energy and fertilizer substitutes. Designed to handle multiple biodegradable feedstock including fruit & vegetable peels, cooked food waste, ganji water, used kitchen oil/grease, garden waste & organic waste water. Special culture (bacteria consortium) seeding in the digester, resistant to cold climate, fostering high waste break-down efficiency . Far superior to conventional bio-digesters in terms of – overall performance, safety, plant life and efficiency, ease of operation and maintenance, no scum formation. Remote Monitoring: App based performance tracking and reporting with continuous data analysis. AES team is composed of research scientists, engineers, technical analysts and experienced on-site teams – all ready to assist you reduce waste and recover valuable resources. COOKING: Direct thermal usage of biogas to directly replace LPG or PNG for cooking – by adding customized burners and stoves or by modifying existing burners if possible. 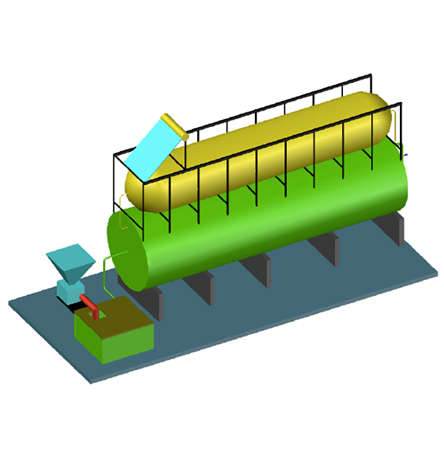 STEAM GENERATION: Direct thermal usage of biogas to generate steam through biogas driven Steam Generators. © 2017, AESPL India, All Rights Reserved. Design By Cybatesoft Pvt .Ltd.